During the 2017 Championships, IBM iX created a prototype Messenger application to start exploring delivering content into the platform. The goal was to identify the best way to deliver content on the platform while also starting to understand the elements that would succeed in future deliveries. We developed a user journey flow, taking advantage of Facebooks Postbacks, quick replies, and other utilities to streamline the user experience. The idea was to keep interactions simple. We then moved on to design a system capable of allowing us to deliver the desired data points and user features. The architecture above is based on the N-tier architecture pattern. This is a pattern familiar to our team, and it allowed us to reuse existing integrations and APIs for the delivery of scoring and content management elements. We used both Redis Compose and Cloudant for data storage. The Facebook platform (at the time of writing) does not provide a state for a given interaction; each request is stateless. As such, we used Redis to store any useful state information for the interaction. User’s subscriptions were stored and maintained in Cloudant. The application had three core components. 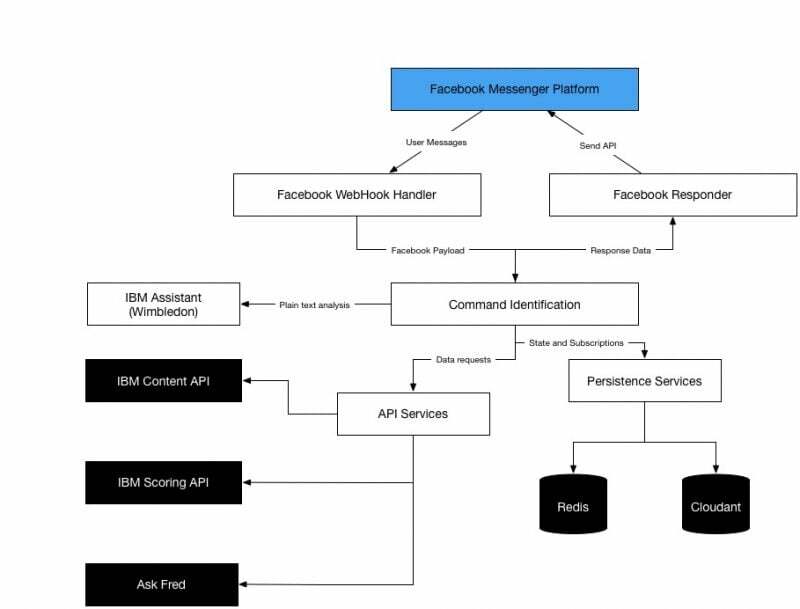 The Facebook Webhook handler handled new messaging payloads from the Messenger Platform. Command identification was used to identify the appropriate services and data components to pass the request off to, and the response was then returned to Facebook through a Facebook Responder component. This part of the series will focus on our interaction with Facebook instead of the whole flow; those features will be covered in subsequent posts. You can find details of the Facebook Webhook for messages on their developer site. IBM iX built a liberty runtime on IBM Cloud to act as our WebHook interaction. You can see the sample framework we built using JAX-RS with Jackson below. It is important to note here that all our Provider classes extend a common base abstract class that provides common utility functions to all providers. In our implementations, that BaseProvider extends JacksonJsonProvider. This allows for the JAX-RS adaptor to make use of the most recent Jackson annotations, such as @JsonIgnoreProperties(ignoreUnknown = true). If you use the out-of-the-box liberty JSON processor, this tag isn’t adhered to it. You can add the Jackson Base Provider by adding the following to your gradle dependancies. We created the relevant POJO’s for the Provider to parse the data from Facebook into by following the documentation on their developer site for sample payloads. In future articles in this series, we will demonstrate how we identified and and gathered the appropriate data. In this piece, we will just focus on how we sent payloads into Facebook. First, we looked at the type of data we were going to be sending and matched that to the relevant templates. We then constructed a Responder class as a singleton that any service could invoke to respond to Facebook. Instead of using Jackson to unmarshall the POJO, we instead used Apache Freemarker, a Java templating library for this activity. We created and compiled templates for each of the response times, and then the Provider would render the standard data objects against the template and send the resulting string into the Facebook Send API. In this article, we have reviewed the base integration with Facebook and our overall approach. In the next part of this series, we will look more closely at how we took the data from Facebook and identified the right service and data to render back to the recipient.